Upon its release, Sorry To Bother You has been described by several major review sources (including The BBC and The Guardian) as this year’s Get Out. Sorry To Bother You is not this year’s Get Out. Yes, both films are biting satires, one utilizing the horror genre to expose the subtle and not-so-subtle ways that racism still pervades our country, and the other utilizing absurdist humor to analyze how the heads of major organizations focus too much on the bottom line, ignoring the morality of their products or the basic needs of their employees. But to say that writer/director Boots Riley’s film debut (having been the lead singer of The Coup since 1993) is this year’s version of Jordan Peele’s directorial debut (for which he deservedly won a screenwriting Oscar) robs both films of how unique they are. We should let these films stand on their own and be analyzed separately from each other. Before I continue, I, ironically, have one comparison to make between this film and Get Out. Both films’ first viewings benefit from going in as empty as possible. 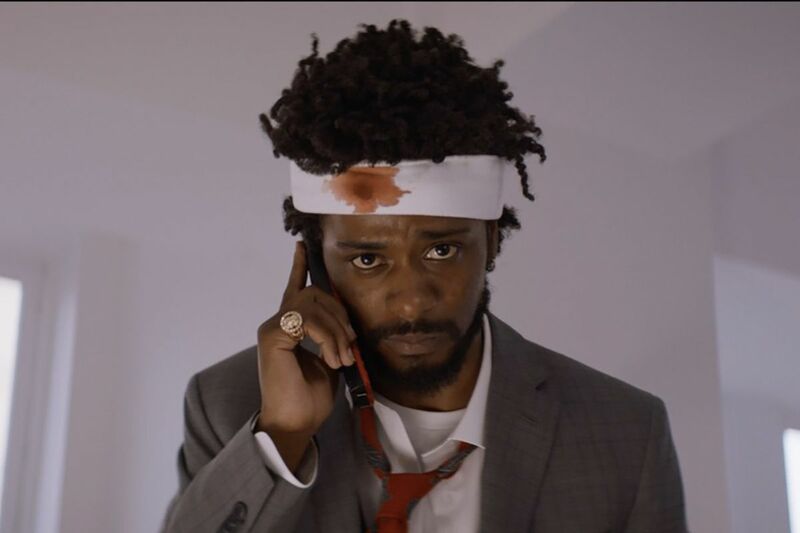 Although the previews for this film set-up what feels like the most fantastical part of the world, that black telemarketers (including Atlanta and Get Out [okay one more similarity]’s Lakeith Stanfield) are most successful when they use their “white voice” (Mr. Show and Arrested Development’s David Cross supplying Stanfield’s), the back half of this movie is really something else and I would really hate to ruin anything about it so points of this review will be a bit vague. The film is at its best when Riley is showing off his particular style of world-building and absurdism, of which the idea of a “white voice” barely scratches the surface. Outside of the initial reveal of Cross’s voice coming out of Stanfield’s mouth (set in a bar as all background noise cuts out), “white voice” is treated as something that is totally normal in the world, which, honestly, kind of fits. This is a world that only has three tv channels: one that plays a singular, profane game show on a constant loop, a news channel that has a very wide definition of “news”, and a channel that plays an MTV Cribs style program that showcases the living quarters of WorryFree, a company that for sure isn’t slavery (it is). As we watch Stanfield’s Cassius “Cash” Green make his telemarketing calls, we watch as he and his desk literally fall into the living quarters of his customers. The code to use a secret elevator appears to be 100-numbers long. Again, this is all stuff we encounter within the first twenty minutes of the movie. It gets so much weirder and more surreal, and that’s where the point really starts to hit home. Where I feel like this movie falters a bit is its characters. Nobody’s character in this movie really feels particularly fleshed out in any real way. As the film’s protagonist, Cash is the only character that really feels like he goes through anything resembling an arc, as he struggles/succumbs to the temptations of a higher paying job at his telemarketing company and adjusts his persona as he delves deeper and deeper into the strange world. Stanfield does really well with the arc, with the humanity and natural hesitation he brings to Cash helping him remain as a generally likable character, even as he makes increasingly frustrating decisions. Beyond that, though, all the other characters feel unfortunately one-note, despite strong performances throughout the cast. The always-welcome Tessa Thompson does what she can to elevate Detroit beyond the general/basic idea of the “eccentric artist girlfriend.” Jermaine Fowler’s Salvador and Steven Yeun’s Squeeze do well as characters that basically boil down to “Cash’s none-too-bright friend/co-worker” and “surprisingly normal co-worker/leader of the strike.” Armie Hammer almost steals the movie as Steve Lift, CEO of WorryFree, as he smartly performs the character as reasonably calm, despite the fact that the information he is giving is the furthest thing from reasonable (did I mention he properly shows up in the back half of the movie?) Each performance in this movie helps create characters that flirt with memorability, even though the script itself doesn’t really provide them with much complexity. But, at the end of the day, despite some character issues, this movie still works and that’s because this movie’s focus isn’t necessarily the characters (outside of Cash). It’s about the world it creates and the points that it makes about our world. It confronts something that needs to be confronted in a way that feels genuine and honest, while peppered with a wonderful absurdity that grabs your attention. That’s what is truly wonderful about this movie, and the satirical genre in general. The message it has will stick with you in a way that a more straightforward or subtle piece might not, while also capturing the interest of a wider audience than it would typically receive. While that point is far from obvious while looking at this film’s box office (Riley is far from a household name, and Annapurna Pictures little more known as a film distributor, with four other films to its name, none of which have made more than $50 million worldwide), I can guarantee you that everyone who has contributed to this film’s take will never forget it or its message. Riley’s film isn’t “the next” anything. It’s the only Sorry To Bother You, an achievement worth celebrating on its own.